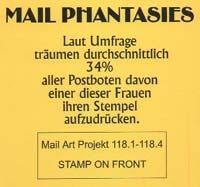 Inspired by a Mail-Art Call on the Internet, the Mail-Art Project118.1-4, also known as Mail Phantasies was created in August 1998. A woman is pictured on the front of the card and the top right corner of the back (normally reserved for the stamp) says: "stamp on front". The subtitle on the front reads "Surveys show that ?% of all postmen would like this woman to bear their stamp." The percentages differ on all four cards and (like the official title) refer to the date of origin (11.8.1998). This text accompanied the Mail Phantasies during the Exhibition at the Hauptbahnhof.